We know and understand the loyalty of our Apple folks, and iBooks is an excellent reader. 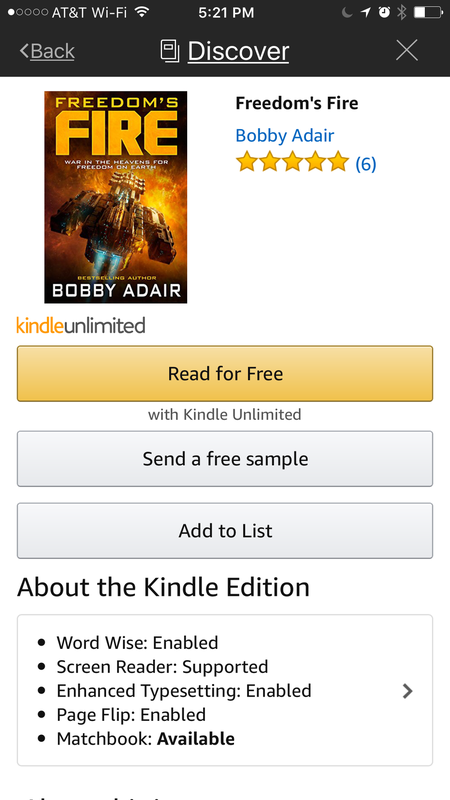 However, because Apple and Amazon are competitors, accessing Amazon's books from your iDevice is a little different, depending on whether or not you're a member of Amazon's Kindle Unlimited program. If you are a member of Kindle Unlimited, you can purchase KU books directly from the Kindle App on your iPhone or iPad. Use the Amazon "Browse" function, which may be the Amazon logo. First, download the Kindle App from the iTunes Store. Click here to find the app. Next, purchase the book through the Amazon WEB PAGE, not the Amazon App on your iDevice. Open Safari or Chrome and visit www.amazon.com, log in, and purchase the desired book. You'll have to use the Buy now with 1-Click button. Launch the Kindle App. The book should be automatically downloaded into the Kindle App.